Shuffleboard courts made of plastic that can be assembled inside as well as outside and feature an outstanding gliding ability, all from Planet Shuffleboard. Our game surfaces offer the best glide qualities on the market, all at better prices than conventional cement courts. Planet Shuffleboard's game surfaces are THE SOLUTION to your gaming problems! No more beads, messy wax and re-painting. Play indoors as well as outdoors using the same detachable court. This is the smartest solution ever. Instead of limiting your playing time to just a few months during the summer, you can benefit from a full 12 month investment by playing indoors during the winter or when it’s just too hot to play outside. The do-it-yourself assembly (6' x 3' sheets) takes just 15 minutes! Over the past 20 years, shuffleboard players all over the planet have enjoyed the gliding, portable, secure and maintenance-free shuffleboard courts that Planet Shuffleboard offers as an alternative to conventional cement courts. If you are looking to refresh your current installation or are simply looking for a brand new one, our exclusive plastic tile design offers you the best market value and comes with a 20 years warranty. 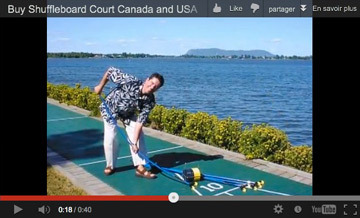 Your shuffleboard court is manufactured in Canada (not in China), offering you the best price, guaranteed! Our courts start at $950 CAD. They are available in official and compact sizes . It can also be custom-made to fit your needs. We can also include your company logo directly in the design. See or photos gallery. Our shuffleboard courts are constructed in two sections. The first is a plastic tile measuring 1 ft.2 by 5/8” thick. There are perforations throughout the court allowing water to run through it. It is also designed to offer maximum glide for shuffleboard disks. The second section is the yellow siding. This piece measures 6” long by 2” wide. One side is 5/8” thick and the other 0, creating a slight inclination. There are two reasons for this: one is to bring the disks back into play without having to bend down and the other, to avoid tripping over the edge of the court.